This is one crazy ride. Sheer terror. You are so high in the air. Be prepared for one of the best rides around. You do have to pay a hefty price to go up there though. That is what hurts the rating. The ride itself it truly awesome. If in Vegas check this one out(if the budget allows). What a rush. A totally insane rush, that is. Thats all that can be said, really. If this was on the ground, it wouldnt be anything special at all. Its not all that tall - on its own, there is no special theming or anything like that. Stick it 900ft+ in the air, and you have something special. Provides the single best view of the Strip and surrounding mountains you can get. Big Shot a Tower of Power kind of thing located on the spire of the tower. This is the only time I have been shot into the air and have felt that I have completely left the ground. An absolutely thrilling and terrifying sensation. Delicious - check it out! The ride was very short. Even though the view was incredible, and it looks very scary, I didnt think it was. It was also like $12 bucks! This is the best freefall ride on the planet. I really like PT at Cedar Point but you cant beat the location. The height scares the heck out of you. 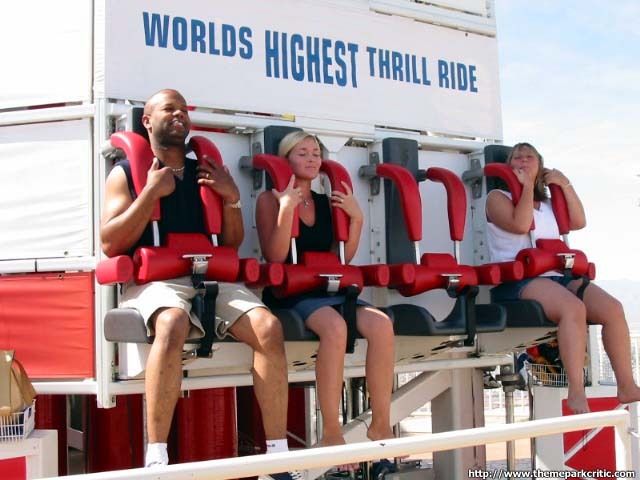 This is the best ride out there in vegas a must ride for thrill seekers!!! In histoy i do not think there could be anything more terrifying (other then X-Scream) for such a concept of putting rides on the top of a building, Brilliant! The ride itself is amazing, airtime incredible, and the view is breathtaking. On this ride you are at a mis of words. Come out here and try it! This is probably the hardest my heart has ever beat. I have seen it run serveral times, but never forked over the $12 for one ride. Yes that is insanely high, but it is only $3 for another ride. It actually is only $17.95 for hotel guests and local residents for allday. 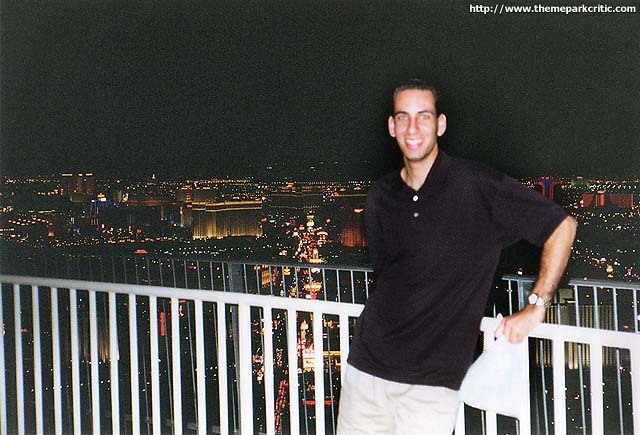 So my advice is either stay at the Stratosphere or give them the zip of some friend you might have in Vegas. It seems like you are cheating them but think of it this way. They charger $8 just to get up the tower..... Well anyways this ride is insane. They have to keep you at the bottom of the launch enough to get you heart up to 170 BPM. Then you are blasted to 45 in 2.5 sec. 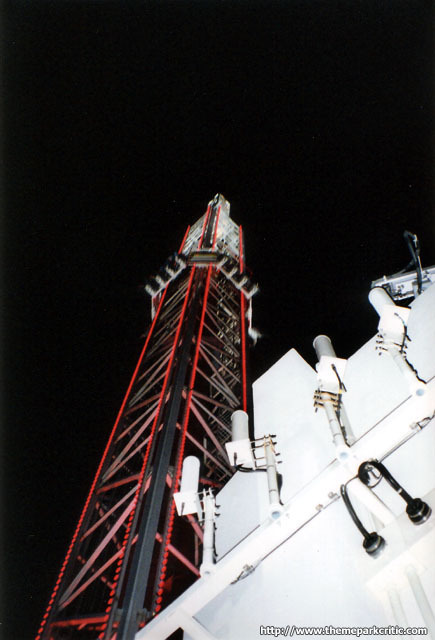 You then reach the top height of 160 ft above the tower where you feel NEGATIVE gs. You dont float, you come completely off your seat. 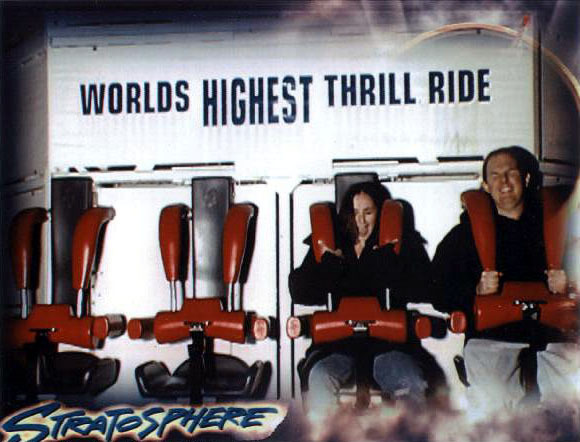 It isnt as intense negative gs as the Turbo Drop, but it lasts longer and you experience it the first trip down and on the second trip down. 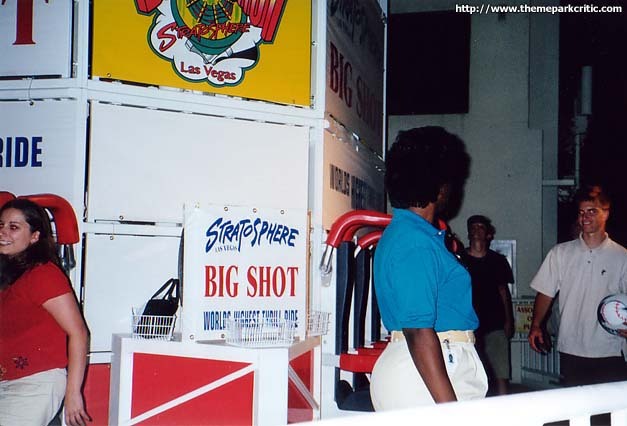 My advice is to hit this, maybe ride it a couple of times but then go over to Speed: The Ride, which is the best ride in Vegas. This is the most thrilling but it isnt the best. But it is good enough to be right behind Speed: The Ride in the best rides in and around Vegas. Absolutely terrifying and I loved every minute of it. Truly a one-of-a-kind experience. 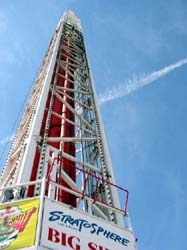 Find me another 1000+ foot tall launched freefall ride and then we can talk. Until that day, this one reigns supreme my friends. 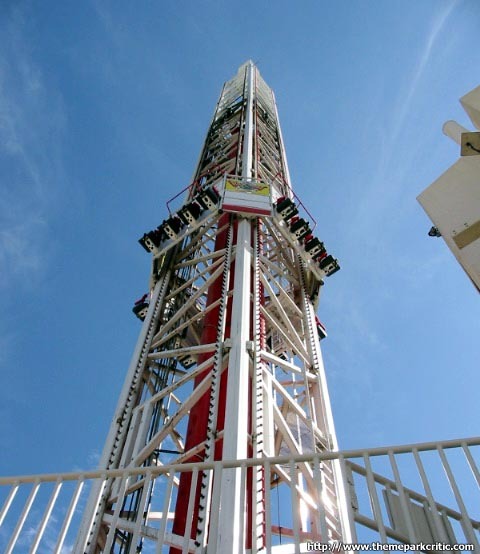 This 200 ft high structure is a first rate amusement ride on its own, however its placement at the top of the Stratosphere Hotel-Casino (over 500 ft) in Las Vegas makes it incredibly intense and provides a spectacular view of the city, especially at night. Take a deep breath as you get launched upward because you will feel as though you are going to be catapulted vertically right into space. 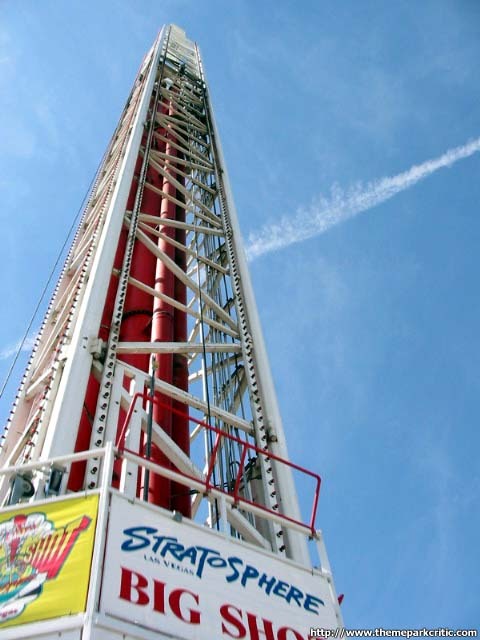 The exhilaration you feel when you get launched and finally reach the peak of the ride (close to 1000 ft? in the air) is indescribable. 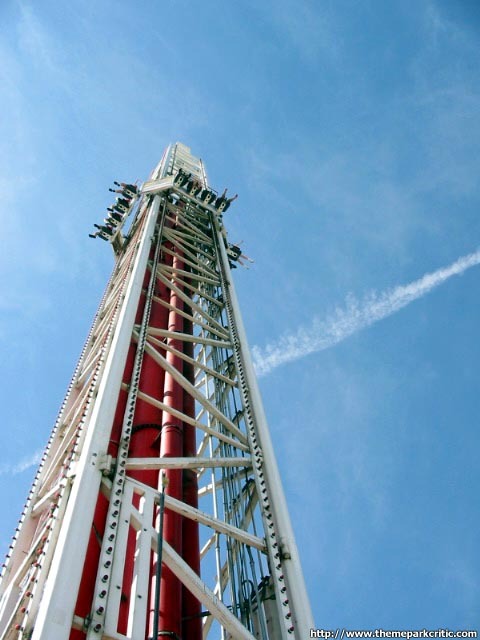 The ride is a true fix for the adrenaline junkie because you can literally feel a "Big Shot" of adrenaline surge your brain on this ride as you are launched, when you reach the peak and when you are dropped back down. The only drawback is that after the first surge, your brains receptors are craving the experience again!